"LIVING WATER (The Surfer's Mass)" is an experiment in taking surf music into a new realm. The Malibooz see surf music as a form of American music as fundamental as the blues. It's rhythms recall the pulsations of the ocean. 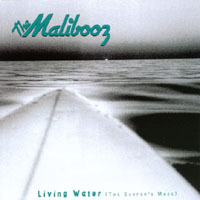 With the release of "LIVING WATER (The Surfer's Mass)" John Zambetti and Walter Egan are celebrating over thirty years of making music together as The Malibooz. Even before its release, songs from the CD appeared in the Joe Eszterhas feature "An Alan Smithee Film, "Burn, Hollywood, Burn" starring Sylvester Stallone, Whoopi Goldberg, Jackie Chan, and Eric Idle. Over the years Walter and John have also worked on each other's solo projects, including Egan's "NOT SHY" album that was produced by Lindsay Buckingham and Stevie Nicks. The album spawned the million selling single "Magnet & Steel" which recently appeared in the Golden Globe and Academy Award winning movie, "Boogie Nights". Currently "Magnet & Steel" is featured in the film "Deuce Bigelow" produced by Adam Sandler. Zambetti has also worked with film producer Michael Manheim on the film "Leap of Faith" and with producer Rick Berman on "Star Trek, First Contact". As The Malibooz, Walter and John also have songs in New Line Cinema's "Theodore Rex" and the Rhino Films release "Plump Fiction". "LIVING WATER (The Surfer's Mass)" is an experiment in taking surf music into a new realm. The Malibooz see surf music as a form of American music as fundamental as the blues. It's rhythms recall the pulsations of the ocean, while the heavily reverbed guitar sounds mimic the crashing surf. Surf music then adds to this, ethnic influences, mainly from Spanish and Middle Eastern cultures, and reinterprets them with electric instruments to portray the California experience as purely as the blues reflects the experience of the Mississippi delta. In putting this project together, Zambetti has taken the discipline of writing within the format of a Mass and used the vehicle of traditional surf music. By using Old Testament references of the ocean and sea life, he elicits our response to the ocean's natural spirituality which is especially powerful when you are one with the ocean, surfing. Originally written just as an exercise, the project soon took on a life of it's own when demos of the original 4 songs began to circulate. The enthusiastic response to the music encouraged Zambetti to finish the 12 songs of the project and Cello/Sire Records took The Malibooz to the studio to record it for a release by The Pier Group. "LIVING WATER" was chosen one of the Top 5 Albums of 1999 by D.J.Johnson of C.D. Magazine. One of the songs from the CD, "Bitter Water", ended 1999 as the #1 MP3 download at Indiespace.com. I am a Christian and Jesus is everything. I grew up in the 60's and still today, love Brian and the Beach Boys. I have always prayed that some day Brian too, would fall in love with Jesus and write songs of praise with his beautiful harmonies. Songs 6-11 touched me. I had tears in my eyes to hear surf music with words that lifted up Jesus. I hope you do more. Whether its Christian or not, keep doing it with harmony. Thanks for the music. John, I wrote a review yesterday and was in a hurry, so I would like to add a bit more. Again, songs 6-11 were the highlights for me and I rate them 4 stars or more. I have been waiting since my teens to hear surf music with Jesus lyrics. Thank you so much. I am so glad that you and others still continue to make this kind of music. It's always been the best as far as I'm concerned. Hey, I want to give you something in return. Go and get this book, "the Final Quest", by Rick Joyner. It will undo you, if you are someone who loves the Lord. One fellow recently said it fileted his heart. I cried so much thru it. It will show you a big glimspe of heaven, Jesus and how much he loves us. The best book I have ever read, besides the Bible. You won't be disappointed. It may just lead you to make some more music. Thanks again to you and the guys. Please keep making beautiful harmonies.